Visually impaired triathlete Nicolas Dewalque tells us how he got into SwimRun and about his experience at Love SwimRun Llanberis 2016. I’m Nic, I live in Belgium and I’m a visually impaired triathlete always looking for new adventures and sporting challenges. This year with some teammates from the Coaching Zone Team in Brussels I decided to try Amphiman, the only SwimRun event in Belgium! I teamed up with my friend Alain – he’s an experienced triathlete and had previously been my guide when we won the National Paralympic Triathlon title last year. I like trying new sports and extreme events. I’ve been a track runner for many years, and in 2012 I took up triathlon. I only heard about SwimRun a couple of years ago and have watched it become more popular across Europe. The Ötillo concept and spirit fascinated me: the way people have to find their last physical resources to cross the finish line in such a beautiful environment. 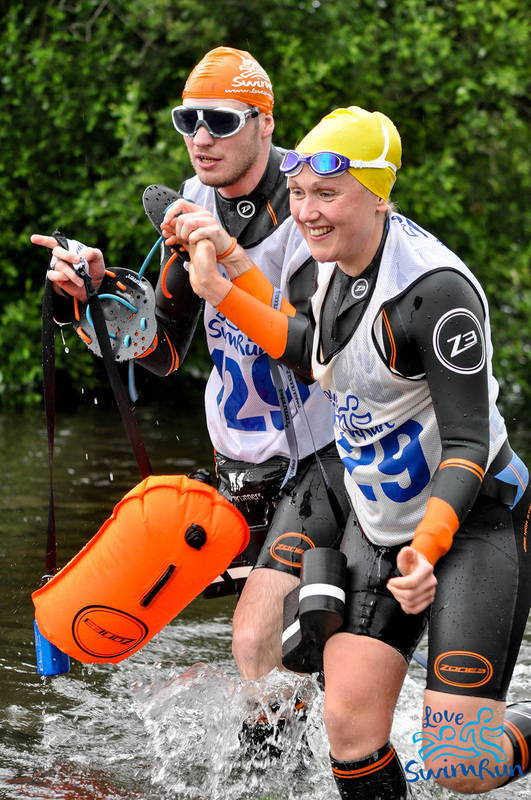 The idea of SwimRun is to work together in pair, but as a partially sighted athlete, I always have to compete with a guide, so for me the idea and mindset of working together was already came naturally. I’m very competitive and I’m always chasing good results but the main difference between triathlon and SwimRun for me is that when I’m SwimRunning I’m much more relaxed. The goal changes and become about doing our personal best rather than trying to be the best, and to cross the line with the satisfaction of having shared a great day with a friend. SwimRun clearly brings more fun into a triathlete’s life: it’s definitely a good workout session but you also have the chance to experience something special. SwimRun events provide you the possibility to explore a new world and new places that you’d never encounter during a triathlon. After starting my SwimRun training I began looking for support and advice to prepare for my first race. This is when I first got in touch with Chloe, the organizer of the Love SwimRun, the first SwimRun event in Wales. She helped me a lot with tips and we had a good chat about the what gear to use. More than that, she invited me to take part of her race in Llanberis. I was honored but decided I’d better wait and to see if I’d enjoy and survive my first SwimRun at Amphiman before booking my flights! Alain and I competed the short course: 18.5km (15km running, 3.5km swimming) but there were a lot of transitions which are slow for me as I need to change my goggles/glasses every time. It was a really warm day but the water was still freezing – going from hot to cold was extra tiring! We had a lot of fun and I really enjoyed it but it was not easy and we ended up finishing the race in 4h10min. A few days later, still buzzing from the experience, I had another look at the details for Love SwimRun. I was amazed by what I saw on internet about Snowdonia and I told Chloe that I definitely wanted to come. She helped me to make it possible, and in a few days she founded a guide to compete with me. Katy Nelson, a keen local triathlete and showed a lot of interested in guiding me and trying what would be her first SwimRun. The rules in official ITU triathlon competitions don’t allow me to have a female guide so this would also give me the opportunity to have a new experience racing with a great athlete in a mixed team! I was very excited and decided to book for a few extra days stay in Llanberis so I could explore the area and practice with Katy before the race. Flying in from Charleroi to Manchester, I caught the train to Bangor, and finally a bus to Llanberis. It was a long day but I was so happy to be there, surrounded by the mountains! I knew by the atmosphere that it would be a lot of fun. The following day I met Katy for the first time, she was lovely and I felt confident that we would make a good team. 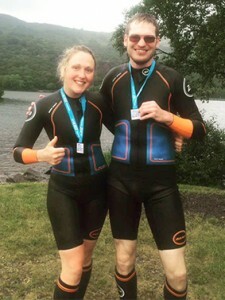 We went for a swim in Llyn Padarn to try out our gear and get to know each others speed and technique and to see how things would work on the day of the race. Swimrunshop.com had sponsored us with specific SwimRun gear and Zone3 had helped in providing the wetsuits. It was fantastic to be supported by these great brands and wearing the gear they supplied really made the event special and definitely helped us. Swimrunshop.com gave us a SWIMRUNNERS™ Pull Belt Guidance Team Kit that was especially useful for me: it helped me a lot during the swim, because I just had to follow the tether of my guide and focus purely on swimming. 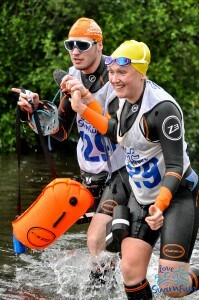 Zone3 supplied us with a Swim Buoy Dry Bag and their Evolution SwimRun Wetsuits. These are much easier to run in than a normal wetsuit but still offer enough warmth and buoyancy on the swims legs. The day before the race, Katy took me to recce some of the runs and transition areas. While we were out we bumped into Chloe and Jonny preparing the last things for the big day, and we later met up at the famous local Pete’s Eats Cafe. They warned us about a technical downhill section in the woods crammed with slippery rocks and roots so we decided to go there in the afternoon to have a look to maximize our chance of racing without any mishaps. It was not scary as I’d imagined but my visual impairment made the chance of taking a wrong step likely, and falling here could cause a nasty injury and cost us the race. The major problem I have with my vision is not being able to see contrast which was particularly difficult in the dappled shade of the trees. I needed Kate to tell me all the time when the surface changed – gravel, grass or rocks on the floor, if there were steps, if it’s going down or up and for how long. We were going to be tethered together during the whole race. We walked slowly and analyzed each section to see where we would have to walk and where we would be able to run. Next morning was race day! The weather was looking perfect: air temperature was not too warm which is always important when you have to run in a wetsuit! The water temperature was also ideal at 17 degrees as the swims were quite long and we were likely to feel the cold as we became tired. Before I knew it we were on the starting – I always feel nervous before a race but then suddenly “Go” – we were running in a mass of other teams. The race began with a short 400m run to a pontoon where you could jump into the first 1.2km swim! The swim seemed to pass quickly as we worked together but next up was the most difficult part of the day: 8.5km of running with a tough climb of 3km up steep zigzags into the old slate quarry. Not many people ran all the way up and I admit we didn’t either! Walking fast was the best choice to keep your pulse low and temperature down, and running wouldn’t have gained us much time anyway. After that, we hit the first food station. I have to say the marshals and volunteers were incredible at every point, taking care and checking the athletes were alright. We grabbed some food and then began to head back down to the lake. I was dreading the rocky bit coming up! We tried hard not to loose to much time in the technical descent and we managed and without any problems and without being over taken! Maybe the adrenaline helped! It was great to have Katy with me as she knew the trails so well – she brought her local knowledge and spirit. The second 1.2km swim back down the lake was made much harder with a head wind and it seemed to go on forever! We were glad to hit solid ground for a flat, fast and furious 3 km running along the lake side. Katy is very strong and fast and I was struggling to keep up with her by this time and then hunger hit me. I downed a gel and swallowed an energy bar virtually whole but still felt empty and I knew we were close to the next transition where we would face another big swim but once I was in the water the bar kicked in, I somehow forgot the fatigue and just kept swimming. Throughout the day we had our own support kayak, paddled by Ailsa Orlik, one of the volunteers. Chloe had arranged this to provide us with some extra safety and support should we need it – thankfully we didn’t but it was great to know Ailsa was there, especially as the race went on and I grew more tired! On finishing the swim, a short sharp 100m run then saw us at the final transition and in to the last 200m swim through the beautiful tree covered lagoons area. This was very different to the rest of the swimming we’d done but I was too tired to appreciate it at the time. Suddenly we emerged from the shaded narrow channel and the finish line was straight ahead. I staggered out of the water holding onto Katy feeling very tired and confused – I wasn’t convinced it was actually the end, but yes it was! Chloe was there congratulating me and hanging a medal around my neck. There are not many races where you receive a hug from the race director at the finish line: this one of the many things that made the LoveSwimRun Llanberis a very friendly and unique event. Katy and I had an amazing race – we’d made a great team! We finished in 3h30min, 15th in the overall team ranking and 6th in the mixed team. I couldn’t be more please with that. Katy managed her role as my guide very well and was always very informative on what was happening and what was coming up. On Monday Chloe had offered to take me to the train station and came over early so we we could have a run together. She wanted to check that all the course markers had been picked up so we headed up the horrendous zigzags again! This time I was able to run to the top. I was also able to enjoy the wonderful views of the mountains and take a look at the astonishing environment that we had run though on the day of the race but that I had barely noticed! I will never forget this fantastic race organised by amazing people and will definitely be back next year! Thank you Katy, Chloe and Jonny for the wonderful experience. You can find out more about Nicolas Dewalque by following his Facebook page here.